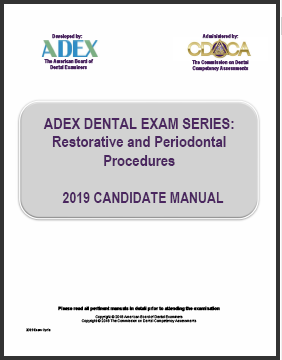 Please read the CDCA’s recommendation regarding the optional ADEX periodontal clinical exam using the following link: Click Here. 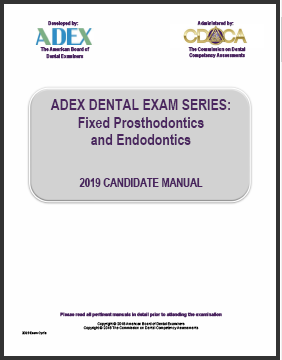 The ADEX Dental Examination is given in two formats: the Curriculum Integrated Format (CIF) and in the Traditional Format. The CIF Format can only be taken by students about to enter their senior year of dental school or graduate students at a school hosting the CIF Format examination. The Traditional Format is for those students who elect not to take the CIF Format and for those who have already graduated from dental school. 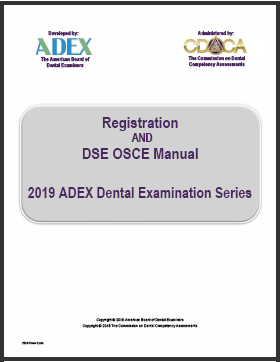 Only students or graduates of schools accredited by the ADA Commission on Dental Accreditation or the Commission on Dental Accreditation of Canada may take the ADEX Dental Examination. All other candidates (including international graduates) must apply through the state dental board in the state or jurisdiction where they wish to practice for permission to take an examination for licensure only in that state or jurisdiction.